Everything I can has come out of my life crises. Oooh! It has been a dark and terrible winter for me. If I hadn´t had my creativity and dreams of the future and of becoming fresh again, and lots of love and support from people around me, I think I would have had a depression now. But it didn´t happen. Instead I have enjoyed the sunrises, the new calmness in my life, and I still do. It is very difficult to let go, when you get used to it. I made a New Year´s resolution that I would begin creating art again though it reminds me of the international artist life, I have lost, dued to my ilness and handicaps. Just didn´t know how to get started again as so many feelings were lining up in my mind. My dream of becoming a free bird again, free of all illnesses, and some healing walks in the daylight last summer in the beautiful Danish nature and bird sanctuaries has inspired me to continue creating some new small artworks here in the first part of 2019, they will be located under menu item "Art Gallery" and "5. Flora & Fauna illustration line" on this website. A bigger new artwork is located under item "2. Abandoned Illustration Line". As you now I have 11 illustration lines, so we have to count in order to locate new posted artworks on this website. Also, I in March 2019 have created a new very special piece of paper art, woven heart art, "Ænder ved Gundsømagle Sø", (Ducks at the lake of Gunsømagle) the very first piece of my own unique art media, woven paper heart, which I have created in 10 pieces of woven paper, as usual without using glue or patterns. Different subjects on front and reverse of heart. I use my own drawings to cut from. So I have hit my own record, which was woven heart arts created in 9 pieces of woven paper, which I developed in 2015. But I posted a videofilm about my woven heart art "Ænder ved Gundsømagle Sø" on my instagram profile @larklisbet where you can watch it. It is a kind of a "brother" to the woven heart art, "Svanelunden" ("The Swan Lake,"6 pieces of woven paper) I have on a permanently Nordic culture exhibition at Izmir Book and Paper Art museum in Turkey since December 2012. My record woven heart artwork "Ænder ved Gundsømagle Sø" also includes a special created furniture craft "duck"-frame/ installation for hanging installation. Artwork is not availble for gallery or museum exhibitions outside Denmark. After finishing it I have had some lucrative international orders on it. But I am a Dane and it is my own international recognized and very unique artmedia with some deep roots in the Danish culture, so in order to avoid a national mass protest I think this artwork should stay somewhere in the Kingdom of Denmark, and therefore it is right now reserved for national art opportunities if possible. If not selected for any Danish art exhibitions it will go directly into the private collection of the Woven Heart Art Museum (Kunstmuseet Julehjertemuseet) where it will be visible when the museum gets a new place to stay in Denmark. I created my drawings, made a budget, made everything ready, because now, it should be: At long last I would create my new miniature bird designs from new materials. Till now I have used recycling materials for my nature look alike 3D bird designs. But 2 months after ordering it showed up, that some of my suppliers could not deliver the special coloured feathers and materials for these new handmade nature like miniature bird designs of mine. So as usual I ended up sitting and sucking with recycling materials, which I tried to strech in use in order to have enough, and I only managed to create 2 larger birds in unequal different sizes, 20-25 cm in length and 4,5 - 6 cm tick: Cutting their bodies from a styrofoam emballage box. Their feathers are food colored chicken feathers from the food industry, a waste product. 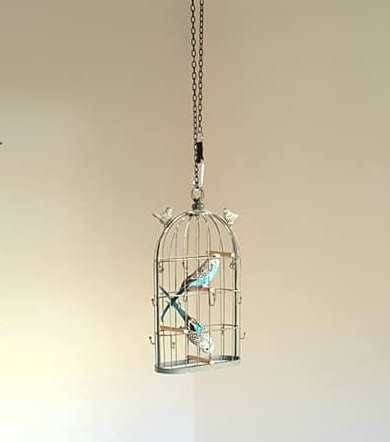 Birdcage I created from 2 old french crackers, and so on. When I finished, still having a mess with feathers everywhere, hanged it up for drying and the webmaster of this website saw it, he bursted out: " Vivid birds, .... or ... are, are, are they alive? ..... What a beautiful and brilliant piece of installation artwork, you´ve created there!... It is absolutely stunning! Does it have a name?" " No, it doesn´t", I said, "it is a result of another failed design project, but it is unique", I haven´t created any other species"... - and then I told him the story about the failing deliveries, and that I had to use what I had instead of just storing the materias for years. Waste of place and money. Now these birds at least could give me some clean company, and make my days when I am most ill, by decorating my resting room. "Not on terms " he said. " This is art on high level, I think. Shouldn´t we show it on gallerioctopusart.dk?" " Under which menu item? I, I, I don´t think they fit in anywhere" I said.
" Honestly I think it is on time you show some of the works you have created the last few years from larger installation artworks which are permanently installed in private homes , because people think you have done nothing lately, and that is not true. You have created the most wonderful and brilliant instalation artworks during your illness period since 2015. I create a new menu item under "Art Gallery" called "14. Installation Art," because you are not only a miniture artist you do huge artworks, too... "
"But , but, but, but, but, but, but ...." ...... I said. This blog is about dreaming and the positive effect it has. My dream is also to get the opportunities to exhibit my art in Denmark,where I am born, raised and live, though I have "only" merit from The Anglo- Italian Academy of Arts, as I am too ill for travelling outside DK with my art. In 2019 I have 10 years anniversary as a professional artist, so I think it is about time, I get my space here in Denmark. Until then artworks will come out of my hands in my own relaxing pace which is compatible with the fatigue I am experiencing as a result of my concusion and my 2 incurable oesopahagus diagnoses, which demand surgery every 3rd month at a hospital in Copenhagen.